As one of Queen Victoria's most beloved painters and portraitists, Sir Edwin Landseer (1802-1873) built his reputation on painting animals in an expressive manner, including horses, deer and dogs. And while he notably designed a series of lion sculptures for London's Trafalgar Square, Landseer's dog paintings of the 1830s remain his most celebrated works today. As a dual portrait, Dignity and Impudence (1839) is arguably the most popular of all, and is included in the collection of the Tate Museum. The picture's composition parodies the Dutch portrait tradition, whereby the subject is framed by a window, with an arm or hand extending over the edge, just as the bloodhound's paw hangs over the edge of the kennel. Brown responds to this anthropomorphism and recasts many of Landseer's signature elements to question what makes an endearing painting. In his 2001 version he removes the doghouse setting and recasts the smaller terrier as a death's head, thereby producing a campier rendition of the vanitas icon. The added choice of painting the bloodhound in green speaks to Brown's subversive nature as he responds to the notion that green is the most unpopular shade for artworks bought and sold on the market. Once I read that green paintings were hard to sell, so throughout my career I have faced this challenge head on! The well-loved, and rather kitsch painting Dignity and Impotence (1839) by Edwin Landseer (1802-1873), was the inspiration here. 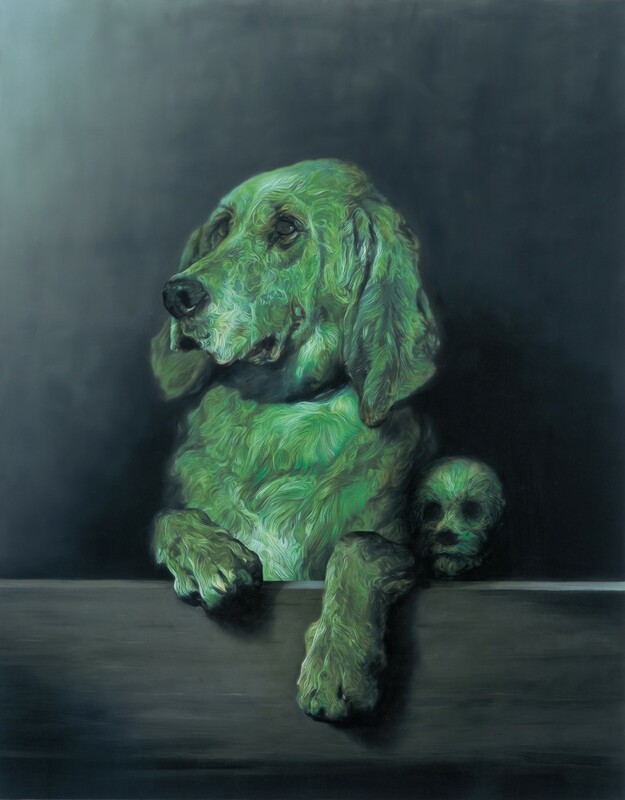 The silky-smooth surface and the haunting green glow gives an anaesthetised, numb feeling - suggesting nostalgia and sentimentality aren't always good things - while the small skull of a dog on the right turns the painting into something of a memento mori.